Fusing the measurement and benchmarking of customer satisfaction, operational productivity and employee engagement can furnish you with immense intelligence to improve the performance of your customer service operation. 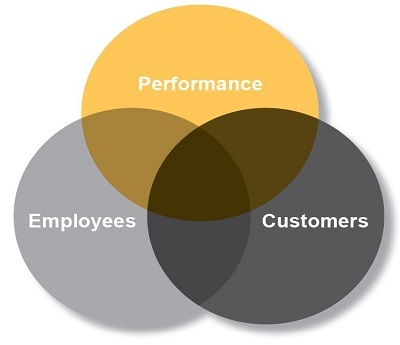 Best in class performers all realise the dangers of measuring one of the “three key areas” in isolation. They all drive each other and will help you find sweet spots to avoid spending money in vain on things that will neither benefit customers nor the company. Measuring speed of answer in parallel with customer satisfaction (C-SAT), will give you the breaking point for how long customers are prepared to wait before scoring your C-SAT or NPS low. Add perceived advisor engagement, FCR and knowledge into the mix and you will see that if customers are happy with any of these metrics, their acceptance of a slower speed of answer grows. Something a retailer realised, and they managed to lower cost by 40% and increase C-SAT by 10%, just by analysing and understanding how everything is joined up. Saving managers’ time is another key benefit. As an example the graph shows a manager first having found out that advisor engagement is key to driving NPS by correlating the two, and then seeing that if he or she focuses her time on the 15 advisors in the silver circle, getting them into the gold, the impact on NPS will be significant. Adding employee survey results provides an interesting dimension to the mix. There is a clear link between engagement and both productivity and C-SAT. But what to do about it? By measuring employee survey scores in parallel with the other two you will for example see teams where your advisors have scored manager recognition low that will also score low on NPS. Use this feedback to work with the team leaders on how they can better manage their teams and your C-SAT and NPS scores will improve.